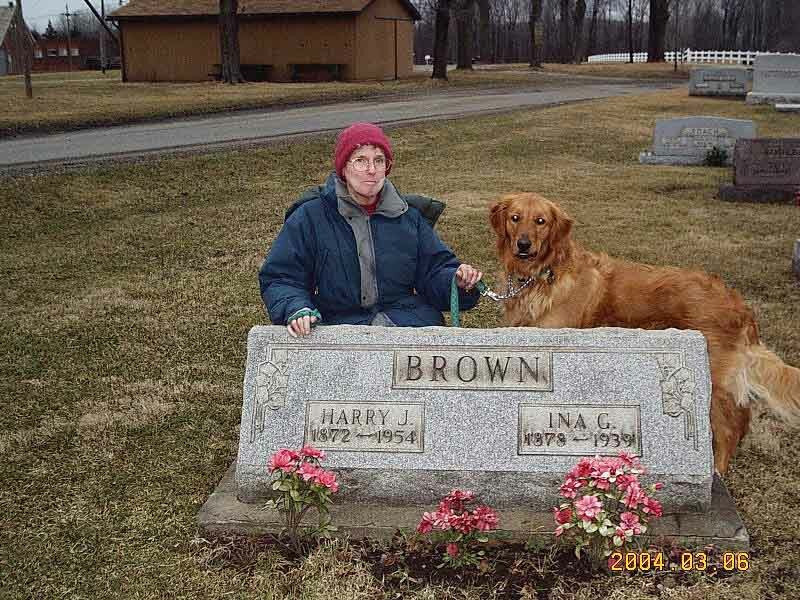 I am Bette Ina Brown, daughter of Paul E. Brown and Pauline Kinsey Brown, born April 1, 1936 in Molly Stark, the TB hospital in Stark County, Ohio. My tombstone is already set on Section D, Quadrant II, Lot 136 in the Augusta Cemetery. I never lived in Carroll County, Ohio until August 2004. At that time I moved with a purpose from Casper, Wyoming to a home built by Embert Leatherberry on Kensington Road in Augusta, Ohio. That purpose was to help preserve the history found in the Augusta Cemetery that was instilled in me by my father. On every trip to Augusta my father would give the family a tour of the Cemetery. He would tell us about the wonderful friends and family he loved who are buried here. In fact, shortly before he died in 1999, I gave him a copy of Carroll County Ohio Cemeteries, Volume I and asked him to write what he remembered about those listed there. In the summer of 2000 I came to Augusta for a visit. I took his notes to my “personal review panel” for advice. That panel consisted of the surviving sisters of my mother, Pauline Kinsey Brown. They were: Christina Ossler, Dorothy Locke, Emma Rhodes and Evelyn Kinsey. Also on the panel were my mother's sister-in-law, Naomi Kinsey, and my mother's niece, Mary Lou Turnipseed Garrett. The panel had a great evening reading over his notes and reminiscing. When I returned home from this visit, my life changed drastically on several fronts. The briefcase that contained Dad’s notes and the comments offered by my “review panel” remained locked in the briefcase for the next five years. In 2005 I was ready to open his memories and use them as a basis for documenting the rich history of the people who came before us and called Augusta, Ohio, "Home." My father was born in Stark County in 1909. 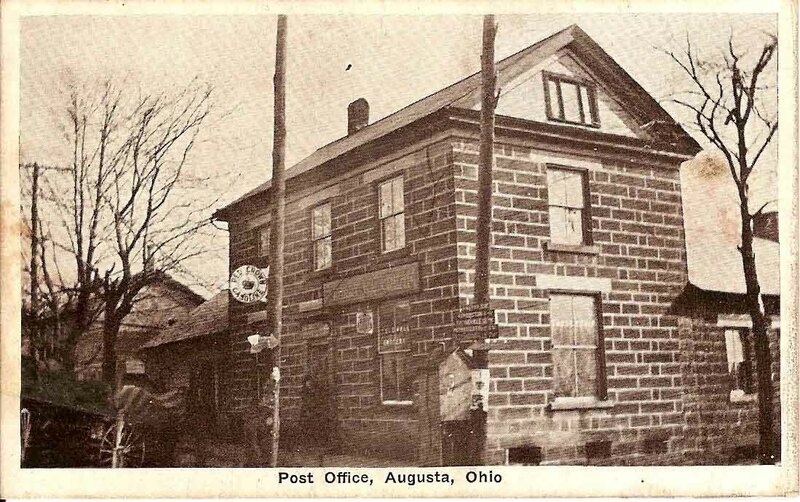 He moved to Augusta in 1916. After high school he taught at Eureka, the one-room school in Augusta Township. 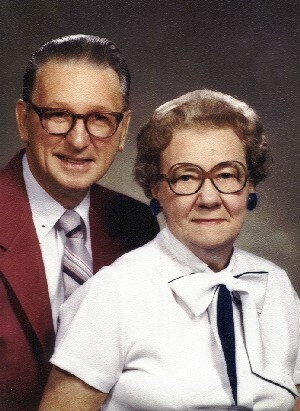 He was forever close to his fellow teacher, Pearle Cameron Pieren. In the 1930’s he moved to Summit and Stark Counties to teach, and during that time he also attended and graduated from Kent State University. In 1932 my mother, who had tuberculosis and been confined to the Molly Stark Sanatorium for some years, was threatened with eviction because she was not a resident of Stark County. She had been my father's next-door neighbor in Augusta, but she needed to be a Stark County resident to stay in the hospital. Thus they were married in 1932. After the marriage she returned to the hospital. Several years later she returned to live with us in Massillon, Ohio. Childhood home of Pauline Kinsey Brown. is the childhood home of Paul Brown. During the ensuing years, my father attended William McKinley School of Law while continuing to teach school. He taught a total of eighteen years before he began his law practice part time. During those lean years, I was the best secretary he could afford. He took me to the Stark County Courthouse and taught me to do abstracting. He taught me much that was useful in my working career. But most especially I had the opportunity to observe his devotion to his childhood friends. It is my hope when I open my briefcase, his words will come to life on the pages of this web site. I must warn you: he was not “politically correct” by today’s standards. I had some concern about “editing” his comments. My review panel was horrified by that idea. So, please remember he was born in a different era. That generation may not have been as enlightened as we are today about political correctness, but they possessed a love and devotion to one another that may be disappearing from sight today. 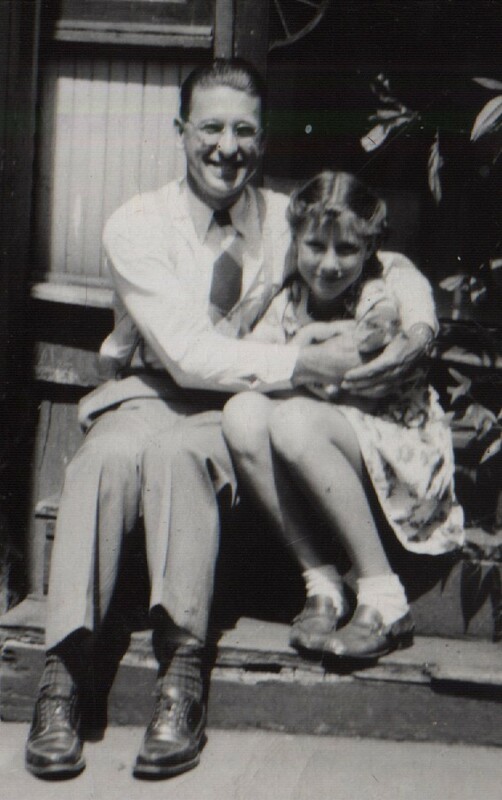 This web site is because of my wonderful father, Paul Edgar Brown, and his devotion to the people of Augusta, Ohio, and is put together in memory of him and my mother, Pauline Kinsey Brown.